Also on Friday, in a separate report, the Treasury Department estimated that it will borrow $955 billion in FY 2018. That estimate is based on input from a group of private banks that advise the Treasury. If the amount is correct (and it may not be), it will represent an 84% increase over the $519 billion Treasury borrowed for FY 2017. This huge increase is clearly not taking us in the right direction, and it’s more than can be accounted for by lower tax revenues. Nor is it a one-time blip. The same report forecasts borrowing of $1.083T in FY 2019 and $1.128T in FY 2020. 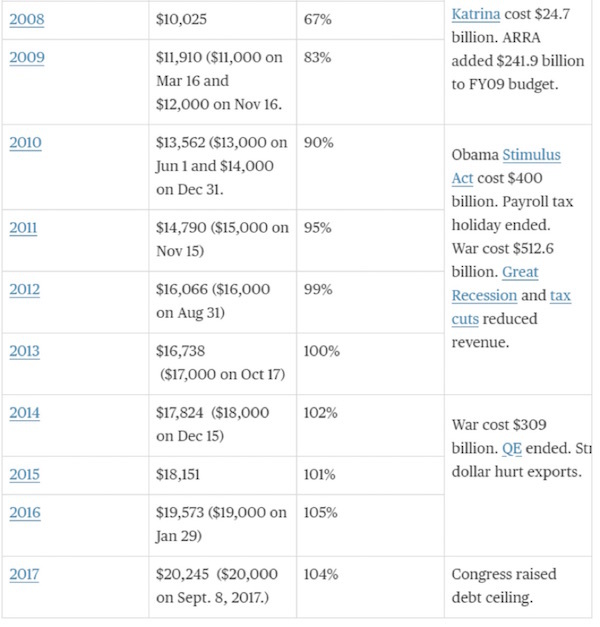 The problem has been papered over by off-budget receipts, mainly Social Security taxes, that give the US Treasury more cash it can disburse. But eventually the benefits those taxes represent come due. Then outlays go up, but revenue may not. Since 2008 the Federal Reserve has greatly simplified Treasury’s cash management task. It has kept short-term rates ultra-low, allowing the Treasury to borrow tons of cash with minimal financing costs. The Fed also bought Treasury bonds directly as part of its quantitative easing programs. 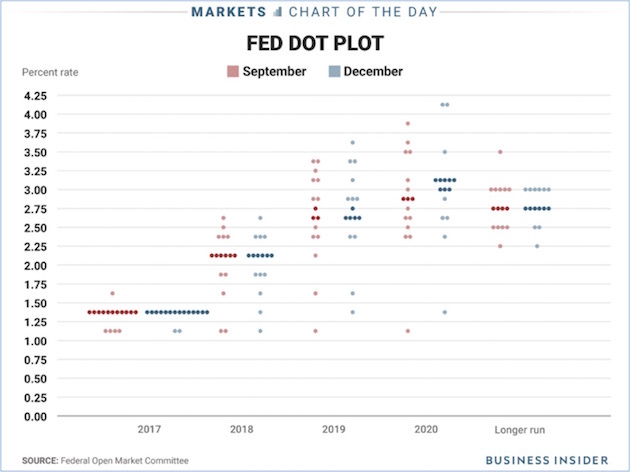 Since the Fed sends most of the interest it receives right back to the Treasury, those bond purchases amounted to almost interest-free financing. The average interest paid on the US debt has been reduced to less than 2%, largely because Treasury has loaded up on short-term debt in order to reduce the interest-rate costs that must be allocated to the budget deficit each year. So rather than focusing on long-term debt with the 30-year at an all-time low, Treasury has been selling short-term bills and notes. That’s good cash management in the short run and very shortsighted in the long run. American savers and investors are prospects if they have money to lend. Unfortunately, the number who do is not growing. It may grow if unemployment stays low and wage growth accelerates, but the Baby Boomers are transitioning from savings mode to spending mode, so they won’t help much. US pension plans and other institutions that need to fund future obligations are natural Treasury buyers, too. Higher rates might entice back some buyers who have moved into corporate or other long-term bonds in the last decade. Then again, high enough rates will entice anyone back, but those higher rates come with a cost. Specifically, each 1% higher is $10 million per trillion dollars of debt issued. On our $22 trillion in total US debt (by the end of the year, give or take a few billion), that will eventually be about $220 billion in interest as rates go up and the debt has to be rolled over. That’s interest per year! You can go to this link to see how much each government around the world has actually invested in US Treasury securities. Interestingly, Ireland and the Cayman Islands are in third and fourth place behind China and Japan. At one point this past year, China actually had a little less in Treasury securities than Japan did, but they are both above $1 trillion total. The next four countries combined are up to $1 trillion+ total. And so on. You will also notice that many of the 10 largest holders are associated with major banking centers. And while their appetite is still rising, it is not growing by much. Meanwhile, as time passes, borrowers who locked in lower rates during the QE years will need to refinance and will find they must pay sharply higher rates. Some won’t be able to do so and will go out of business, laying off workers and leaving their own lenders holding losses. This process will be extreme for issuers of high-yield bonds. As noted last week, there is now a drastically increasing amount of high-yield bond debt that has to be rolled over every year. In three weeks Shane and I will be going to Sonoma, where I’ll speak at my Peak Capital friends’ annual client conference. Then we’ll come back to Dallas, where I will speak at the S&P Financial Advisors Forum in downtown Dallas on Tuesday, February 27. If you are an investment advisor, sign up and let’s try to make sure we get to chat. I always like to talk to my readers. After that, I’ll continue preparations for the Strategic Investment Conference. This is really going to be the best conference we have ever done, and you don’t want to miss it. We have been holding teleconferences with the various speakers on what they’re going to be presenting and how we’ll work the moderating and Q&A panels, and I’m adjusting the lineup a little to make the ideas flow better. If the markets have been a little confusing the last week or so, there is no place better than the SIC to get a handle on what’s coming. I have some of the best economists and market strategists flying in from all over the world. There will be a special emphasis this year on looking at the social and technological changes that are coming in the next 10 years. Our Thursday night at the conference, the dinner presentation will feature Democratic pollster Pat Caddell, who saw the fragmentation of society that led to Trump before anybody else did; Neil Howe, who understands the Millennial generation better than anyone else; Steve Moore; and myself, discussing what we all see as the coming fragmentation of society. And I guarantee you, it will have significant meaning for your investment portfolios. It is time to position yourself for a world that is going to be transforming. And we have so much more at SIC this year. We have just finalized the last couple of speakers, who will address the recent volatility. I always try to leave a spot or two open to cover the questions that are currently most on the minds of attendees. As I’ve said before, conferences are my artform. You don’t simply gather a bunch of speakers. You find the right speakers and put them in the right order in order to build on the information presented from the very beginning to the very end. And let me close with something from the Ministry of Silly Indicators (located down the hall from the Ministry of Silly Walks). A friend (whom I cannot name) began to muse about whether the world would feel better on Monday morning after the Winter Olympics’ opening ceremony. He went back and looked at the last four Winter Olympics. Going into each of them, the market was in either a downturn or a serious correction. And on every occasion the market turned back around on Monday and went on to make new highs. He did admit that this was a ridiculous indicator, but he thought it was amusing. And with that brief bit of levity, it is time to hit the send button. Let me wish you a great week! And stop procrastinating! Sign up for the SIC and see me in San Diego in a month. EVERY good horror-film director knows the secret of the “jump scare”. Just when the hero or heroine feels safe, the monster appears from nowhere to startle them. The latest stockmarket shock could have been directed by Alfred Hitchcock. The sharp falls that took place on February 2nd and 5th followed a long period where the only direction for share prices appeared to be upwards. In fact the American market had risen so far, so fast that the decline only took share prices back to where they were at the start of the year (see chart). And although a 1,175-point fall in the Dow Jones Industrial Average on February 5th was the biggest ever in absolute terms, it was still smallish beer in proportionate terms, at just 4.6%. The 508-point fall in the Dow in October 1987 knocked nearly 23% off the market. Still, surprise rippled round the world. Between January 29th and early trading on February 7th, the MSCI Emerging Markets Index dropped by 7.5%. The FTSE 100 index fell by 8.2% from its record high, set in January. A late recovery on February 6th, in which the Dow rebounded by 2.3% (or 567 points), restored some calm. What explains the sudden turmoil? Perhaps investors had been used to good news for so long that they had become complacent. In a recent survey investors reported their highest exposure to equities in two years and their lowest holdings of cash in five. Another sign of potential complacency was the unwillingness of investors to pay for insurance against a market decline, something that showed up in the volatility, or Vix, index. Funds that bet on the continuation of low volatility lost heavily (see article). The wobble may also reflect a decision by investors to rethink the economic and financial outlook. Ever since 2009 central banks have been highly supportive of financial markets through low interest rates and quantitative easing (bond purchases with newly created money). There was much talk of an era of “secular stagnation”, in which growth, inflation and interest rates would stay permanently low. 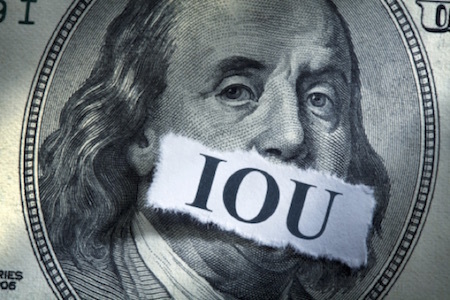 But the Federal Reserve and the Bank of England are now pushing up interest rates, and the European Central Bank is cutting its bond purchases. Future central-bank policy seems much less certain. A pickup in global economic growth may naturally lead to fears of higher inflation. The World Bank warned last month that financial markets could be vulnerable on this front. Bond yields have been moving higher since the autumn; the yield on the ten-year Treasury bond, 2.05% on September 8th, reached 2.84% on February 2nd. On that day American employment numbers were released, showing that the annual rate of wage growth had climbed to 2.9%. That suggested inflation may be about to move higher. 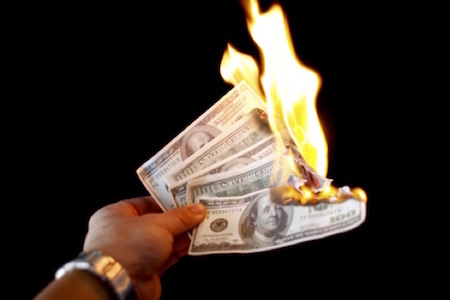 Furthermore, the recent tax-cutting package means that the federal deficit may be over $1trn in the year ending September 2019, according to the Committee for a Responsible Federal Budget, a bipartisan group. Making such a large amount of bonds attractive to buyers might require higher yields. Higher bond yields are a challenge to the markets in a couple of ways. First, by raising the cost of borrowing for companies and consumers, they may slow economic growth. Second, American equity valuations are very high. The cyclically adjusted price-earnings ratio (which averages profits over ten years) is 33.4, compared with the historical average of 16.8. Equity bulls have justified high stock valuations on the ground that the returns on government bonds, the main alternative asset class, have been so low; higher yields weaken that argument. Most analysts seem to think that the latest equity decline is a temporary setback. BlackRock, the world’s largest asset-management group, has called it “an opportunity to add risk to portfolios”. Economic-growth forecasts are still strong. Fourth-quarter results for companies in the S&P 500 index have so far shown profits up by 13% and sales 8% higher than the previous year. Tax cuts will give profits a further lift and companies may return cash to shareholders via share buy-backs. All this will provide support for share prices. Meanwhile inflation worries seem premature. Core inflation in America (excluding food and energy) is just 1.5%. Despite a higher oil price, Bloomberg’s commodity index is nearly where it was a year ago. The same goes for American inflation expectations, as measured in the bond market. 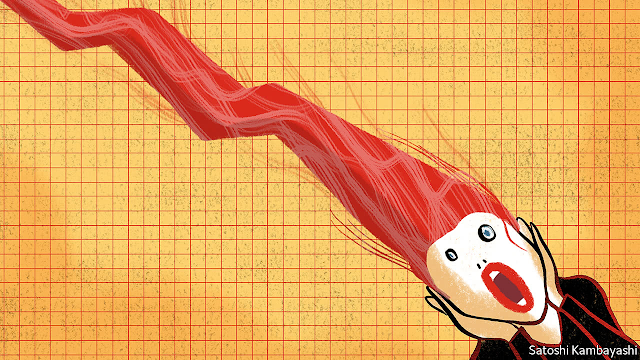 Two issues will determine whether analysts are right to be sanguine. 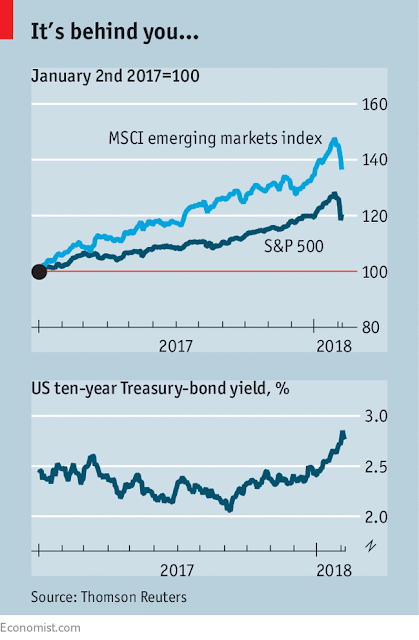 The first is whether the recent gyrations in the stockmarket were reactive, responding to the recent rise in bond yields, or predictive, in the sense of spotting future trouble. The second relates to the theories of Hyman Minsky, an economist who argued that when growth has been strong for a while, investors tend to take more risk. This risk eventually rebounds on them, just as in 2007, when subprime mortgage loans proved worthless. Perhaps the slump in volatility-based funds or even crypto-currencies could cause a crisis at some financial institution, inflicting a dent in confidence more generally. For the moment such dangers seem possibilities rather than probabilities. But like a horror-movie audience, once investors have been scared once, they may prove twitchy for a while. So I think you have a brand new United States.” That was Donald Trump’s boast in his speech to the business elite gathered at the World Economic Forum in Davos. So how, if at all, is America “new”? How might this belief of Mr Trump’s affect his global economic agenda? Why did Mr Trump, who shocked Davos, by stating at his inaugural that “Protection will lead to great prosperity and strength”, become only the second US president to visit the annual meeting in Switzerland, after Bill Clinton, in 2000? Mr Trump’s main aim, it was clear, was to assert that “after years of stagnation, the United States is once again experiencing strong economic growth”. Moreover, it is “open for business”. These and similar claims on employment and consumer and business confidence ran through his speech. It is true that the US economy is strong; it is not true that this follows years of stagnation. The unemployment rate has indeed fallen under Mr Trump, from 4.7 per cent in December 2016 to 4.1 per cent in December 2017, a very low rate by historical standards. But this is a continuation of the downward trend since 2010. If anybody deserves the credit, it is the Federal Reserve, for policies too often condemned by the Republicans. Eighty-six per cent of men aged 25-54 had jobs in December 2017. This is a percentage point higher than a year earlier, but 5.6 percentage points higher than in January 2010. Unfortunately, it is still below the previous cyclical peaks of nearly 90 per cent in 1999 and 88 per cent in 2007. The proportion of prime-aged women with jobs is also below levels in 2000. Mr Trump is particularly enthusiastic about stocks, claiming that the market is “smashing one record after another”. This is not wrong. In terms of Robert Shiller’s cyclically adjusted price/earnings ratio, valuations of the US market are as high as in 1929 and have been exceeded since then only by the exalted valuations of 1998, 1999 and 2000. The rise of the market in the last year is quite remarkable, given how high it already was. But this should be a worry, not a boast. Mr Trump may soon come to regret lauding a high stock market. It is at no president’s beck and call. An argument for hoping that better times will soon be here is the huge tax cut for business. It is quite unlikely, however, that this will unleash a flood of investment and higher underlying economic growth. A more plausible view is that it will mainly increase stock prices, wealth inequality and the speed of the competitive race to the bottom on taxation of capital. British experience on this is sobering. The slashing of UK corporate tax rates to 19 per cent has done little for investment or median real wages. The hope that it proves any different in the US is likely to be disappointed. Briefly, Mr Trump is taking credit for the continuation of a post-crisis recovery begun under his predecessor. This is no “brand new” economy. He has been lucky. Provided the stock market does not blow up, he may stay lucky. Yet the question is how a lucky Mr Trump will behave. Will a man who feels he is on a winning streak be more demanding or more accommodating? A particular concern is trade policy. On this, Mr Trump has stated: “We support free trade, but it needs to be fair and it needs to be reciprocal. Because, in the end, unfair trade undermines us all.” This is not new rhetoric. The pessimistic view is that the administration is hooked on fundamentally crazy doctrines: the US trade deficit is the result not of macroeconomic imbalances, but of cheating on trade policy; in addition, the way to eliminate this deficit is via new bilateral deals with all important trade partners. This approach would blow up the multilateral trading system. It is also incompatible with market economics. Only planned economies could attempt the bilateral balancing in which Robert Lighthizer, the US trade representative, and his master apparently believe. An aggrieved superpower armed with such a benighted doctrine could do immense damage to the global economy and international relations. How then should we evaluate the confident and emollient Mr Trump we saw in Davos? His boasts may be empty, but he has indeed been lucky in inheriting an economy enjoying a strong post-crisis recovery. The economy should remain his friend, so long as he does not trust too much in the stock market. That is good news for him. A strong US economy is good news for the world, too. A confident Mr Trump might not be. The question is how he reacts. Will he be more reasonable or more intransigent? His speech did not provide all the answers. Uncertainty still reigns. Towards the end of financial bubbles, people who previously paid little attention to things like “quality” start trying to figure out what they actually own. The result is either funny or terrifying, depending on the point of view. Debt deals set records from Tajikistan to East Rutherford, N.J., as investors keep hunting yield. Historical limits on who can borrow, and at what cost, have broken down as fund managers agree to previously unpalatable terms. Central bankers in the U.S., Europe and Japan helped shape the new breed of deals by simultaneously purchasing over $1 trillion in high-quality bonds since 2009 and lowering benchmark interest rates to jump-start their faltering economies. 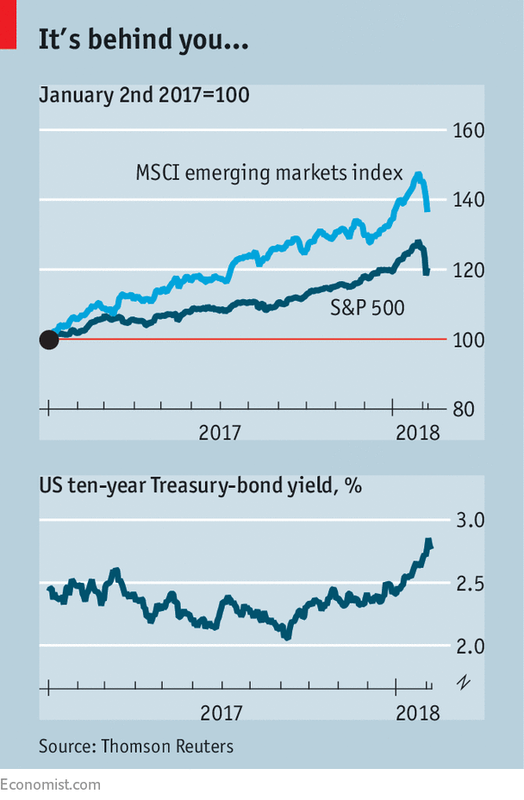 Modest economic growth came, but the strategy crowded private investors out of safe debt, prompting them to buy riskier bonds to boost returns. Retiring baby boomers amplified the trend by moving their investments away from stocks into bonds, boosting assets in U.S. bond mutual funds to $4.6 trillion in November from $1.5 trillion a decade earlier, according to the Investment Company Institute, a trade group for investment firms. The article goes on to present some examples of bonds that might not exist in less bubbly times. Tajikistan borrowed $500 million to finish construction of a hydroelectric dam that was started under the Soviet Union. This is one of the world’s most corrupt countries – a fact noted in the offering prospectus — and the dam’s electricity will be sold to Afghanistan, which, as most Americans know, is in the middle of a civil war that the “good guys” might easily lose (also mentioned in the prospectus). The deal’s investment bank, Citigroup, initially marketed the bonds to yield 8% but received such a warm welcome that it cut the rate to 7.1%. Buyers included big U.S. firms like Fidelity, which bought $14 million of the bonds, presumably to boost the yield of funds sold to retirees. The American Dream Mall in East Rutherford, N.J. broke ground in 2003 but ran out of money to finish construction. In 2017 the mall’s current owner—its third—employed Goldman Sachs to sell $1.1 billion of 6.9% muni bonds, fully half of which were bought by the Nuveen fund family. “Unlike most malls, American Dream will derive most of its revenue from experiential attractions that can’t be replicated online, rather than depending on retailers,” said a Noveen executive. On Nov. 8, Portugal sold €1.25 billion ($1.55 billion) of 10-year bonds that yielded 1.94%—the lowest rate ever for the country. Portugal needed an international bailout in 2011 and still has a junk credit rating. It’s one of the most heavily indebted countries in Europe, but the auction set its borrowing cost below that of the U.S. government, which sold 10-year bonds in November to yield 2.31% [those bonds now yield 2.7%]. What does all this mean? In a nutshell, crazy stuff has been happening under the placid surface of the fixed income market. None of the three bonds profiled here are especially good bets, and retiree and pension fund portfolios are full of similarly toxic paper. When a few such deals blow up – as bubble assets always eventually do – investors will start wondering what’s going to blow up next. And they’ll find not just a few but many, many bad ideas lurking in their “low risk” accounts. The resulting stampede for the exits will look familiar to anyone who lived through the tech stock and housing busts of previous decades. With one big difference. This time around crappy, crazy paper is not just in tech stock and ABS portfolios. It’s everywhere. Trillions of dollars of sovereign debt will tank along with the sketchy shopping mall and emerging market infrastructure bonds. The resulting bust will be more broad-based and therefore way more interesting than anything that’s come before. The Dollar Breakdown: A Sign of Inflation to Come? Recently, we saw the dollar index (the DXY), which measures the USD against a basket of the world’s major currencies, break below its support of 91 for the first time since January of 2015 (Figure 1). This event may signal the most important trend of 2018: the breakdown of the dollar. The recent drop of .96 percent was the second largest drop in over a year and caught many traders by surprise given the recent strong U.S. retail sales data which increased their expectations of a rate hike in March to 75 percent. Some of this selloff can be attributed to the strengthening Euro that came after the German Chancellor, Angela Merkel, announced an agreement to form a coalition government. This deal had been struck after months of negotiations while the weakening dollar has been a year-long trend. Shortly after President Trump was elected in November of 2016, we saw the dollar rally over 5.5 percent only to hit a peak of over 103 in December of that year. This should worry the President-elect since exports and manufacturing jobs will remain uncompetitive as long as the dollar continues to strengthen. Sure, he can place disruptions in the market such as tariffs to make foreign goods less competitive, but that would start an international trade war which would be a zero-sum game. Instead, the President-elect, once sworn in, can manufacture competitiveness through fiscal policy. 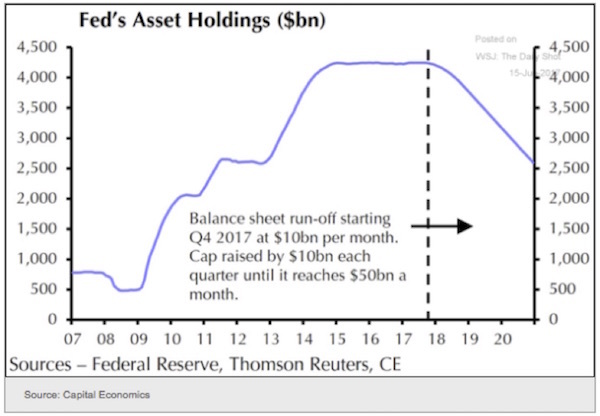 With Trump’s planned tax cuts coupled with his planned infrastructure spending … the fiscal policy measures once implemented will be highly inflationary which should be good for gold [and bad for the dollar].” —Is it Time to Catch a Falling Knife? Dec. 15, 2016. Furthermore, a strong dollar would likely exacerbate the U.S. balance of trade deficit by making foreign goods cheaper. Both things Trump has stated multiple times he is looking to fix and he himself acknowledged the best way to do this is by having a weaker dollar. “Janet Yellen, the Chair of the Board of Governors of the Federal Reserve, has her term ending on February 3rd, 2018. The Fed’s main mandate is to keep inflation rates at 2 percent. With an inflationary fiscal policy regime implemented by Trump, Janet Yellen could be the only person to stand in Trump’s way. That is why Trump will most likely not reappoint Yellen, and instead appoint someone who would be more amenable to keeping rates low. Furthermore, there are two vacancies on the board and they will most likely be dovish replacements.“ —Is it Time to Catch a Falling Knife? Dec. 15, 2016. So it did not come as a surprise when Trump announced he would be replacing Yellen with Jerome Powell as his choice to lead the Fed in November of last year. With Powell set to take over in February, it is likely he will take an even less aggressive approach to raising rates than that of Yellen. Either way, the weaker dollar has helped sustain gold’s buoyancy despite the five rate hikes we have seen since 2015 (Figure 3). Looking back over the past year, one can see there is a strong inverse relationship between gold and the dollar which has only strengthened over the past month. I believe the recent slide below support levels opens the door to a rally that could be similar to what we saw in the early 2000s, when the DXY broke down from 120 and fell all the way to the low 70s in 2008 (Figure 4). There are two major factors which I believe influence gold. The aforementioned dollar and real interest rates, which is the nominal rate set by the Fed minus inflation. A weaker dollar obviously means a stronger gold price in dollar terms but the real rate’s influence is a bit more convoluted. Since both Treasurys and gold are seen as safe-haven assets, investors who are worried about market risk have a choice to park their savings in a “risk free” asset that has a yield (Treasurys) or one that does not (gold). If real rates are positive, investors will likely favor Treasurys, since they provide a yield above that of inflation. However, when the inflation rate is greater than or equal to the nominal rate, investors prefer gold, since parking cash in Treasurys yields a negative return. However, despite the Fed's efforts to manufacture inflation through historically low interest rates and large-scale asset purchase programs, we still have yet to see the Consumer Price Index (CPI) rise significantly, hence real rates have remained in positive territory. The best way to view real rates is by looking at the yields of Treasury Inflation Protection Securities (TIPS), where the principal is adjusted up and down based on CPI data. Looking at the 10-Year TIP (Figure 5), one can see the inverse relationship of TIPS to gold. What arguably sparked the end of the 5-year bear market in gold was the fall of the TIPS yield from 0.7 percent in January 2016 to negative real interest rates by July 2016. Since then, the 10-Year TIPS yield has bounced off the bottom to .53 percent. 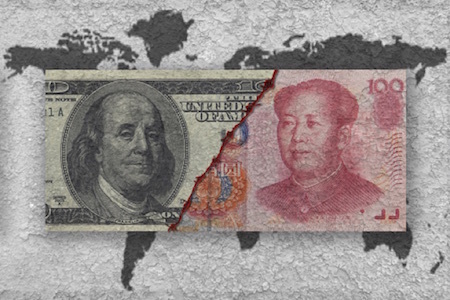 With the recent decline in the dollar, from a U.S. consumer’s perspective, foreign goods and services will now cost more than they did a year ago considering the dollar has declined over 12 percent. With over 27 percent of the of the U.S. GDP made up of imported goods and services, the effects will be felt far and wide. Though inflation takes time, there is a very good chance we could see real interest rates begin to decline over the coming year. WASHINGTON, DC – US President Donald Trump and his Secretary of the Treasury, Steven Mnuchin, have promised an economic miracle. They argue that when the United States adopts their policies, it will consistently achieve annual economic growth above 3%, or even above 4%. After a year of being in charge, pushing hard on deregulation, and getting what it wanted in terms of tax cuts, how is the Trump team doing? In fact, under Obama, the quarterly growth rate surpassed 3% seven times, and even reached 4.6% on two occasions. From the third quarter of 2009, growth was positive in every quarter, save two. But not only was headline growth sturdy under Obama; his administration also presided over considerable job growth – the economy added more than two million jobs annually in seven out of his eight years in office – as well as falling unemployment and higher labor-force participation. Far from a miracle, Trump has failed to deliver any kind of improvement to economic growth. To understand why, it helps to remember that Trump has not actually done much in office. Notwithstanding his constant bragging about deregulation, the total economic impact of his regulatory repeals has been trivial relative to the size of the economy. Moreover, the tax cuts that Trump signed into law at the end of 2017 will have very little positive impact on growth. The tax package is primarily about redistribution from middle-income households – particularly those in high-tax, Democratic-leaning states such as New York and California – to the richest Americans. People who own capital that is already in place – such as large buildings in New York – will do well. But the law does not offer much of an incentive to invest in new capital, either by launching a new company, developing new products, or investing in new plants and equipment. Furthermore, as I pointed out at a recent Intelligence Squared US debate in New York, the law may actually have a negative effect on research and development, which is a key driver of long-term growth in the US. Looking at the 2017 data, there is no sign that business investment ticked upward under Trump. Yes, this is a volatile data series, because it rises and falls with the usual course of events. But it is also another area where Obama set the bar high during his two terms. The most positive thing that can be said about Trump’s first year of economic policymaking is that he did not deliver on his campaign promise to disrupt trade. The North American Free Trade Agreement (NAFTA) remains intact, as do trade relations with China and other major US partners. The administration did impose tariffs in January on solar panels and washing machines, but those are small relative to the size of the economy. As a result, Trump has not caused a massive, self-inflicted recession, and we should perhaps congratulate his team more often for avoiding that scenario. Then again, we are entering a period of heightened Trump-related risk. 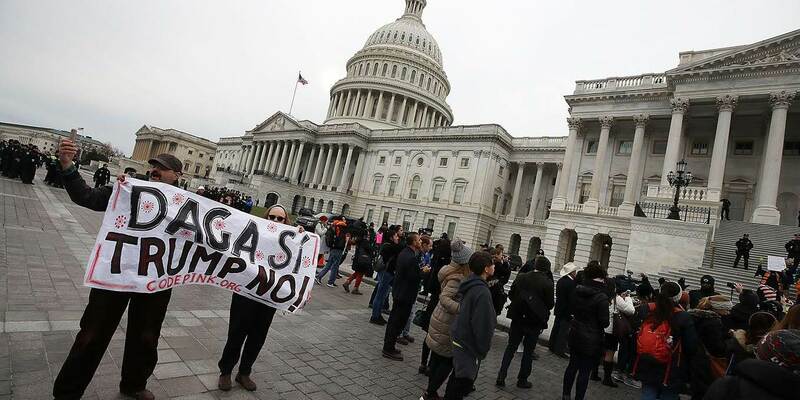 Having terminated the Deferred Action for Childhood Arrivals (DACA) program last year, Trump has put 800,000 young people who were brought to the US illegally as children in danger of being thrown out of the country. Given that these are highly productive people who contribute heavily to the US economy, Trump’s approach could have dire economic, not to mention human, consequences. Trump and his allies are also pursuing sharp reductions in legal immigration, which would reduce the US’s medium-term growth prospects, perhaps significantly. Trump has not abandoned his threat to rip up NAFTA, either. If he does take any steps in this direction, it will not be helpful to the US economy. Ironically, it could also do great damage to the Mexican economy, likely resulting in increased undocumented migration to the US. Without any such disruption, however, demographic trends suggest that migration from Latin America to the US will continue to decline steadily. The biggest danger that Trump poses concerns financial deregulation. Both the Trump administration and the Republican-led Congress are attempting to roll back protections against systemic risk that were put in place after the 2008 financial crisis. Unfortunately, these kinds of attempts to juice the economy typically end badly. When George W. Bush’s administration did the same thing, we were left with the Great Recession.